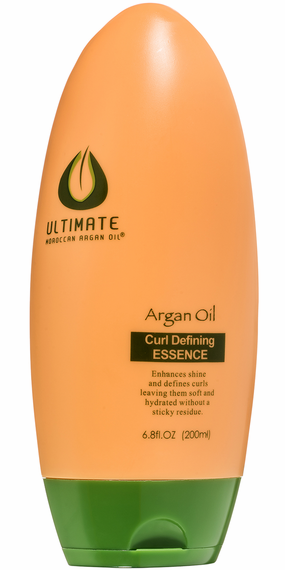 The ULTIMATE Moroccan Argan Oil® Curl Defining Essence is the perfect solution for those with curly or wavy hair that just won't stay tame. Infused with argan oil that is rich in essential fatty acids, antioxidants (such as vitamin E and carotenes) and natural moisturizers, this unique blend of ingredients will give your hair a beautiful shine while keeping it manageable and frizz free. Infused with advanced technology and curl memory that gives the ultimate hold while still retaining lightweight bounce and brilliant shine. ULTIMATE Moroccan Argan Oil® Curl Defining Essence is a dream come true for anyone with uncontrollable and frizzy curls or waves. Don't let your hair control you, control your hair. After shampooing and conditioning, apply a generous amount to towel dried hair and diffuse or let dry naturally.